View The Magnum Home 76 floor plan for a 2584 Sq Ft Palm Harbor Manufactured Home in Early, Texas. 4 Bedrooms, 2 Baths, 2,584 Sq. Ft.
30' wide version of the Magnum Home 76: Model ML30764M - 30'x76', 2,280 Sq. Ft. The eye-catching exterior of The Magnum Home 76 double wide manufactured home by Palm Harbor Homes with 4 Bedrooms, 2 Baths, 2584 Sq. Ft. If you like the clear sight line of today's open, modern living area, then you are going to love this Magnum Home 76 double wide manufactured home by Palm Harbor Homes with 4 Bedrooms, 2 Baths, 2584 Sq. Ft.
Not a fan of a giant TV screen dominating your living area? We have just the cover for you - an attractive, easy-to-slide barn door - in our Magnum 76 double wide manufactured home by Palm Harbor Homes with 4 Bedrooms, 2 Baths, 2584 Sq. Ft. In fact, you can close those doors and hide the TV completely if you want to! The Magnum Home 76 double wide manufactured home by Palm Harbor Homes with 4 Bedrooms, 2 Baths, 2584 Sq. Ft.
From the living area, you can see the kitchen and family room. Everyone has "their own space" in the evening in he Magnum Home 76 double wide manufactured home by Palm Harbor Homes with 4 Bedrooms, 2 Baths, 2584 Sq. Ft. 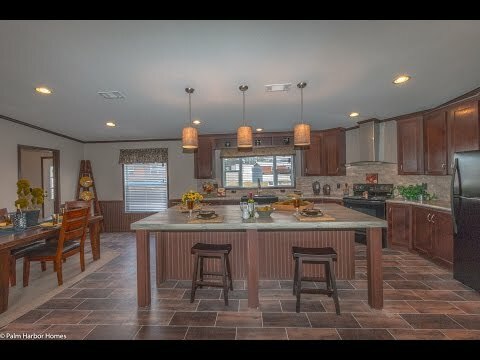 The beautiful, wide-open kitchen serves as the visual hub of this home - the home base for Major Mom and everyone else in The Magnum Home 76 double wide manufactured home by Palm Harbor Homes with 4 Bedrooms, 2 Baths, 2584 Sq. Ft. The dining area is conveniently placed next to the kitchen with durable, easy to clean flooring for high traffic and high spills in he Magnum Home 76 manufactured home by Palm Harbor Homes with 4 Bedrooms, 2 Baths, 2584 Sq. Ft. The work space in this kitchen is elegantly arranged to reduce wasted space and provide maximum interaction with the rest of the Magnum Home 76 double wide manufactured home by Palm Harbor Homes with 4 Bedrooms, 2 Baths, 2584 Sq. Ft. Fantastic large kitchen island with display area for wine or knickknacks on the end in the Magnum Home 76 double wide manufactured home by Palm Harbor Homes with 4 Bedrooms, 2 Baths, 2584 Sq. Ft.
Do you hate being "cooped up" in the kitchen to cook or clean up afterwards? Then the Magnum 76 is the right home for you because this kitchen is "free range" - - with tons of storage, counters, room to work and access to everyone else in the house! One more look at this gorgeous kitchen - - but there's more! So keep clicking - - or go ahead and click the Availability link to find a store near you with a model of this The Magnum Home 76 double wide manufactured home. If you love to shop at Sam's or Costco or other warehouse stores, then you need a pantry like this one in The Magnum Home 76 double wide manufactured home by Palm Harbor Homes with 4 Bedrooms, 2 Baths, 2584 Sq. Ft. The master suite follows the rest of the home - open and airy - with great details throughout in The Magnum Home 76 double wide manufactured home by Palm Harbor Homes with 4 Bedrooms, 2 Baths, 2584 Sq. Ft. The master suite also includes a large walk-in closet and a glorious master bath in the Magnum Home 76 double wide manufactured home by Palm Harbor Homes with 4 Bedrooms, 2 Baths, 2584 Sq. Ft. This isn't just "any old closet" here! This closet has built in shelving and a bench seat that you have to see for your self in the Magnum Home 76 double wide manufactured home by Palm Harbor Homes with 4 Bedrooms, 2 Baths, 2584 Sq. Ft. The master bath is, in a word, magnificent. Double sinks plus a vanity area and an oversized bath and shower plus additional closet space and more in he Magnum Home 76 double wide manufactured home by Palm Harbor Homes. Need more space to get ready in the morning? We have added a vanity area in the Magnum Home 76 double wide manufactured home by Palm Harbor Homes with 4 Bedrooms, 2 Baths, 2584 Sq. Ft.
And on the other side of the bathroom, we have a huge soaker tub for soaking your cares away with a glass of wine in he Magnum Home 76 double wide manufactured home by Palm Harbor Homes with 4 Bedrooms, 2 Baths, 2584 Sq. Ft. The large tub in the master bath has plenty of built-ins for storing or displaying your favorite items in the Magnum Home 76 double wide manufactured home by Palm Harbor Homes with 4 Bedrooms, 2 Baths, 2584 Sq. Ft. In the master bath, the commode area is separate - and an additional walk-in closet offers plenty of room for all your clothes in the Magnum Home 76 double wide manufactured home by Palm Harbor Homes with 4 Bedrooms, 2 Baths, 2584 Sq. Ft. The oversized shower is tucked behind the sink and mirror area and offers entrances from both sides in the Magnum Home 76 double wide manufactured home by Palm Harbor Homes with 4 Bedrooms, 2 Baths, 2584 Sq. Ft. The family room and the secondary bedrooms are down at the other end of the house in the Magnum Home 76 double wide manufactured home by Palm Harbor Homes with 4 Bedrooms, 2 Baths, 2584 Sq. Ft. The family room is naturally warm and inviting with a fireplace, wood ceiling beams, and a built-in entertainment center in the Magnum Home 76 double wide manufactured home by Palm Harbor Homes with 4 Bedrooms, 2 Baths, 2584 Sq. Ft.
Game night, sleep-overs, crafting projects - - this room is built to handle it all with style and grace in the Magnum Home 76 double wide manufactured home by Palm Harbor Homes with 4 Bedrooms, 2 Baths, 2584 Sq. Ft. The utility room in the Magnum Home 76 double wide manufactured home by Palm Harbor Homes with 4 Bedrooms, 2 Baths, 2584 Sq. Ft. Secondary bedrooms in he Magnum Home 76 double wide manufactured home by Palm Harbor Homes with 4 Bedrooms, 2 Baths, 2584 Sq. Ft. Even the secondary bath has two sinks in the Magnum Home 76 double wide manufactured home by Palm Harbor Homes with 4 Bedrooms, 2 Baths, 2584 Sq. Ft.